Scientists in Germany are reporting development of a new, more effective method to determine whether milk marketed as "organic" is genuine or just ordinary milk mislabeled to hoodwink consumers. Their report appears in the current edition of ACS' Journal of Agricultural and Food Chemistry. In the study, Joachim Molkentin and colleagues point out that organic milk has soared in popularity in many countries. Sales in Germany, for instance, rose by almost one-third between 2006 and 2007. Consequently, crooks may take advantage of the situation by marketing increasing quantities of fake organic milk. That situation created a need for better tests to detect the fraud. To address the issue, the scientists developed a test based on an analysis of milk fat for the ratio of stable isotopes of carbon. They used it to identify milk samples from cows raised on feed containing a higher ration of maize. Such a feeding regimen is typical of conventional milk production. Organically raised cows are fed less maize but more pasture feed. In addition, the team identified a significant difference in the alpha-linolenic acid content of milk fat between organic and conventional milk samples. 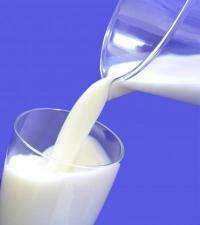 Organic milk typically has a higher alpha-linolenic acid content than conventional milk.